MindEdge, an innovative, educational content provider of online courses to colleges and universities, recently announced its collaboration with Cognii of Boston. 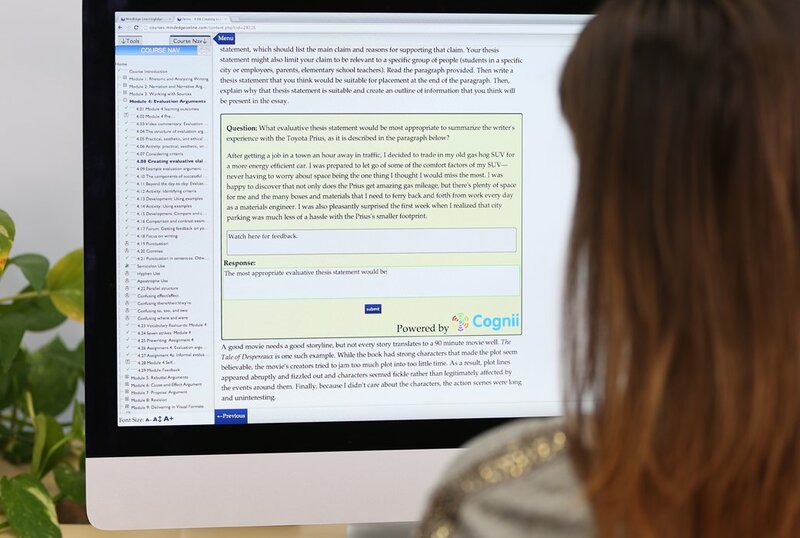 Cognii provides leading-edge assessment technology to evaluate essay-type answers for online learning platforms. This collaboration allows MindEdge to expand its adaptive learning to include Cognii's multi-concept assessment solution in selected online college courses. In MindEdge's writing courses, Cognii will present students with a series of formative exercises around thesis writing, where their responses will be compared to expected answers. Students will be provided with interactive feedback as the software assesses which key concepts are present in or absent from their responses. Students will be "coached" by Cognii until their thesis statement matches the model. The goal is to empower independent student learning. MindEdge is piloting these exercises in Composition I and II courses among its higher education partners. CEO Jefferson Flanders commented on the collaboration, saying, "Cognii lets MindEdge complement its existing adaptive learning with a solution that engages students and provides them with real-time feedback. Cognii is the ideal partner in addressing the next frontier in online learning: personalizing instruction for students." Dee Kanejiya, Cognii's founder and CEO, stated, "We are very excited about working with MindEdge as the content provider and a learning platform through which we can reach the students at some of the largest universities in the US. Education today is going through disruption, however, assessment is still dominated by a century-old multiple-choice format. We believe it's the right time to re-imagine the possibilities of learning and assessment in the digital landscape with the help of cognitive computing and AI (artificial intelligence) technologies." MindEdge provides narrative learning enhanced by diverse content delivery methods such as video, interactive exercises, learner assessments, and simulation technology. Clients include colleges, universities, associations, and corporations. Cognii is a Boston-based start-up that is bringing innovative technological solutions to the education market. Its founders have deep expertise in natural language processing technologies through experience at Vlingo and Nuance. Cognii's goal is to provide the Siri-like virtual learning assistants for education and training.